Jerome Corsi and Randy Credico are two latest Stone associates to face Mueller. Jerome Corsi, who until recently served as D.C. bureau chief for InfoWars, the alt-right program hosted by right-wing conspiracy theorist Alex Jones, and political humorist and radio show host Randy Credico are the two latest Stone associates to be summoned to testify in Mueller's probe into Russian meddling in the 2016 presidential election. Reached by phone on Wednesday afternoon, Corsi confirmed to ABC News that he received the subpoena from the special counsel to appear before Mueller’s grand jury Friday but declined to comment any further on the matter. (Mark Wilson/Getty Images, FILE) Roger Stone, former confidant to President Trump speaks to the media after appearing before the House Intelligence Committee during a closed door hearing, Sept. 26, 2017, in Washington, DC. Corsi’s lawyer, David Gray, told ABC News that Corsi received the subpoena last week and that his client plans to testify on Friday. "We're going to bring any materials he has [on phones and computers] and be fully cooperative with emails or text messages they want to see. Nothing we see shows criminal liability on Mr. Corsi's part," Gray said. Gray added that he is attempting to schedule an interview with the special counsel's office tomorrow afternoon and that a possible meeting Thursday might impact Corsi's scheduled testimony before the special counsel grand jury on Friday. "My guess is their interest is in communications my client had with Roger Stone in the 2016-2017 time frame," Gray told ABC News. When asked if he thinks the special counsel could be interested in questioning Corsi about Wikileaks, Assange, or Guccifer 2.0, Gray said, "Probably, but I don't know for sure." Corsi's subpoena was first reported by the New York Times. In August, Credico received his subpoena to testify before the federal grand jury in the special counsel's investigation this Friday, his lawyer Marty Stolar told ABC News. Stone served as an adviser to Trump’s presidential campaign but left in 2015. Stone continued to advise Trump informally. He has been under scrutiny in part because of statements he made in August of 2016 that appeared to hint he may have known in advance about WikiLeaks' plan to release damaging information on Clinton. He says he didn’t. Stone has also confirmed he communicated with Guccifer 2.0, the unnamed hacker who has taken credit for breaking into Democratic National Committee email servers, sources told ABC News, but said Stone said the exchanges were brief and innocuous and denies knowing Guccifer 2.0 was a Russian operative. These subpoenas bring to ten the number of people with ties to Stone who have been contacted by the special counsel, according to interviews with witnesses, others who say they've been contacted, and sources with direct knowledge on the matter. In addition to Credico and Corsi, they include Stone associates and former Trump campaign aides Michael Caputo and Sam Nunberg; Kristin Davis, the one-time “Manhattan Madam,” who claimed she supplied high priced prostitutes to former New York Gov. Eliot Spitzer (he denied those allegations) and who has worked for Stone and remains close with him; Stone's former driver and assistant John Kakanis; Stone's one-time social media adviser Jason Sullivan, and former Stone aide Andrew Miller. Corsi, who stoked such false rumors as President Barack Obama not being born in the U.S., joined InfoWars last year but has since departed. Corsi has been acquainted with Stone – who currently serves as a key contributor to InfoWars – for years. Corsi's name surfaced earlier this year after investigators with Mueller's team spent almost an hour interviewing Theodore Roosevelt "Ted" Malloch, 65, an American academic and conservative London-based author, discussing his ties to Stone, Corsi, and Wikileaks, according to a post-script for Malloch's latest book. Malloch told ABC News in April that the questioning occurred in March after Malloch was detained by federal agents at Boston's Logan Airport upon arrival from his home in London. Malloch's pro-Trump political book, "The Plot to Destroy Trump: How the Deep State Fabricated the Russian Dossier to Subvert the President," describes the encounter as “intimidating.” In the post-script of his book, Malloch describes the interview and says agents seemed particularly interested in his connections with Stone, Wikileaks, and Corsi, who he described as a Trump campaign a journalist who edited a memoir he wrote years ago, When asked to comment on the latest subpoena issued to Corsi, Stone directed ABC News to a March 2017 InfoWars article by Corsi titled, "DOCS DISPROVE MEDIA’S RUSSIAN/ASSANGE CLAIMS AGAINST STONE: How Corsi was responsible for Stone’s 'suspicious' tweet, not Assange or the Russians." In the article, Corsi claims that in August of 2016, he was involved in a research for Stone on Podesta and Clinton's ties to Russia. Credico name has also surfaced as a possible link between Stone and Assange. Stone told Congress in September 2017 that he asked Credico to act as an intermediary for him to contact Wikileaks publisher Julian Assange to confirm that Assange had a cache of information on Clinton during the 2016 campaign. In July, ABC News reported that Credico had been contacted by special counsel investigators seeking an interview and that he would not do so voluntarily, but would comply with a subpoena if the special counsel’s office issued one. 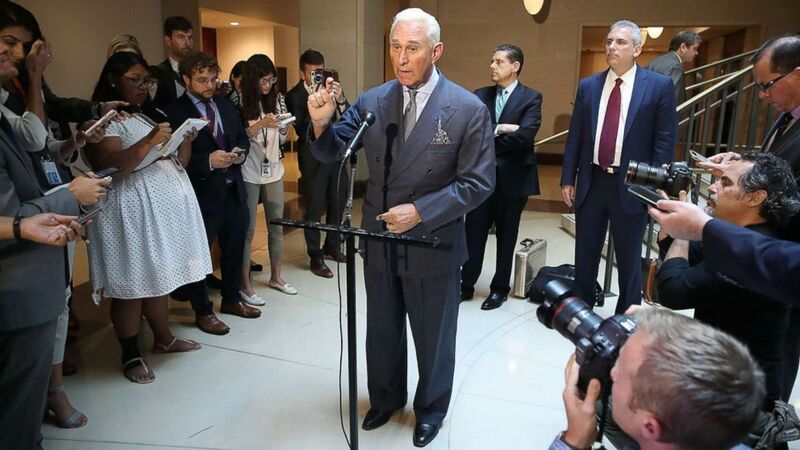 In July, Stone appeared in special counsel Mueller’s indictment against a dozen Russians intelligence officers – he has confirmed to ABC News he was the unnamed Trump campaign regular who corresponded with Russian hackers. The indictment alleges that the 12 Russians engaged in a sustained effort to hack Democrats and aides to Clinton during the 2016 presidential campaign. Stone, who has taken credit for persuading President Trump to get into politics, served as an adviser to Trump’s presidential campaign but left amid controversy in 2015. Stone continued to advise Trump informally after he departed from the campaign.